KawaiiPunk - Kawaii Mascot Blog: OMG! Lia? Cute as a Button! This, my fellow kawaii followers of fashion, is OMG! Lia? Neat, isn’t it? OMG! Lia? 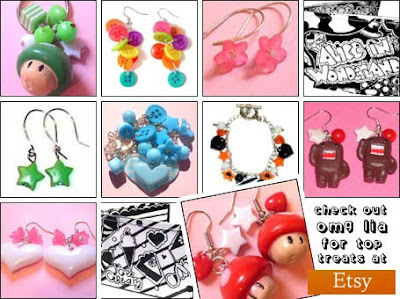 is a super cute Etsy shop that specialises in making colourful handmade creations from recycled jewellery. So, not only is this shop a good friend to the environment, it’s also a great buddy to anyone looking for something truly unique. And if that isn’t a win win situation, I don’t know what is! Happy shopping!